In my post LED’s Control through TTY, I demonstrated how I can control the Arduino IO’s through Wifi using the ESP8266 module (which I wrote about in my past post ESP8266 ($4 Wifi Module) Bring Up. I am going to attempt to control the LEDs though a web page served up by the Arduino through the ESP8266. The first step is to just have my setup be able to send out out a very simple web page to start. Disclaimer: I do not claim to have any expertise here so forgive me if things are not complete and not totally correct. After some research, I found out the basics of a web server. A web page request will by default try to connect to the server at port 80. So I set up my server to have port 80 open. It is very similar to what I did in my post Simple Communication through ESP8266 Wifi module that listened for a client on port 8888. Just changed the AT+CIPSERVER=1,8888 to AT+CIPSERVER=1,80. I did this and pointed my web browser to the IP address of the ESP8266 and the ESP8266 spit this out…. the “GET / ” (“GET” with a blank space immediately after the “/”) is a HTML request. 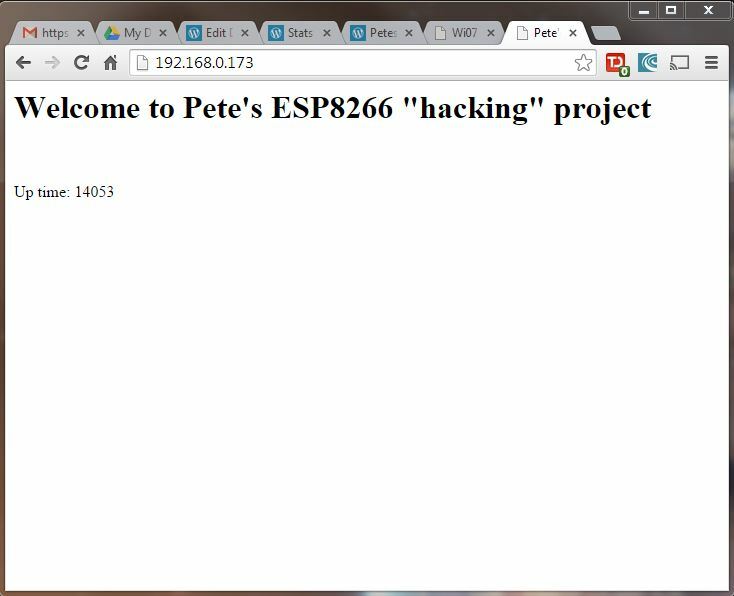 the “+IPD,0,336:” is something the ESP8266 firmware is adding to the actual web request from the client. The “0” would be the channel a specific client is using. There can be multiple clients so the ESP8266 is signifying which client is sending that request. The “366” must be the number of characters was received from the host. Parse incoming characters and look for any occurrence of “GET / “. Parse out the IPD channel and send back a very simple HTML code web page. Send a “AT+CIPCLOSE=<IPD CH>” to tell the client I am done responding to the request. If I don’t, my browser still keeps loading even though the full HTML page is completed. So I struggled with the parsing because I kept missing characters if things came in too quick after each other. I totally redid the parsing vs. what I posted in Arduino Parsing for Occurrence of String from Serial Port. That worked for simple data but seemed to slow for more data coming. Too hard to explain my final hacked implantation so you can try to dig through it in the attached code below. Note: I add some Arduino code to add the time returned from “millis()” (time the Arduino has been running in msec) after the “Up time:” in the page. Helps me make sure that I am really getting an updated page from the Arduino and not just some buffered or stale data. This works pretty well for the most part and I can refresh the page a few times and get the Arduino to send back the page with the update up time. I can even get it to work from my PC, move over to my Android tablet and get the page over there, move over to my Android phone and get the page over there, etc…Problem is that it eventually locks up if I refresh the page too quickly. I am wondering if it has to do with the “GET /favicon.ico” request. Will debug and post about it next time. Please don’t laugh at my coding. I am not a SW guy and doing this on the fly to just get it to work. Clean up later….maybe. case '\r': // Don't care about carriage return so throw away. // Warning: Will drop any characters coming in while waiting for the indicated response. This entry was posted in Uncategorized and tagged Arduino, ESP8266. Bookmark the permalink. Thanks for the comment! I am REALLY new to how a server works under the hood and just pushing through from pure google “learning” and trial and error. I did a little google’ing and I think I found out what you mean on both issues. Sounds like I haven’t really responded fully to a page request and I found some examples of how to specify a blank favicon. I will give that a try next. I did already tried sending back only the close connection to the favicon request in my last post. It might have made things a little better but eventually I crash. Maybe your 2 suggestions will make it more stable. … which I think is the same favicon.ico request but with an empty string after the GET / which makes my server code think it is an html page request and spit out the HTML page again. I think it is the favicon request again because I notice the “Accept” line shows “*/*” instead of text/html,app…..
Am I not specifying the icon as empty correctly?